Director – John Huston, Screenplay – Peter Bellwood, Lew Lehman & Jimmy Sangster, Story – Gary Sherman & Ronald Shusett, Producer – Zale Magder, Photography – Reginald H. Morris, Music – Andre Gagnon, Special Effects – Martin Malivoire, Art Direction – David Jaquest. Production Company – Borough Park Productions. Psychiatrist Peter Ross is engaged in an experimental program where he subjects a handful of patients to their greatest phobias. As part of the experiment, he gets the agoraphobic Barbara Grey to leave the hospital and go to his place. However, when Barbara enters the office in the apartment and is drawn by curiosity to open the drawer containing her file, a bomb placed there goes off, killing her. The police investigate and grill Ross’s other subjects in the experiment, all of whom have criminal pasts or are on special release from jail. However, the killer continues to target the other patients in the program. 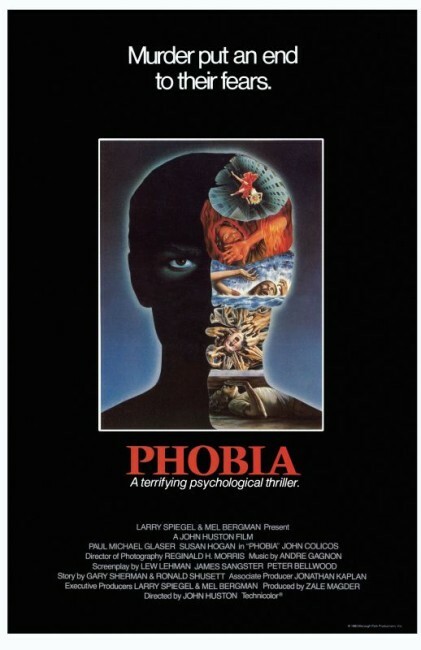 .Phobia would probably have to be the most obscure film in Huston’s filmography. It is the sort of film that you could easily dismiss by saying “well, Huston was seventy-four at the time and probably ailing,” except for the fact that Huston subsequently went onto produce a number of other fine films right up until his death in 1987 that showed he had lost none of his acuity – he had just made the massively underrated Wise Blood (1979) the year before and in the next few years turned out the excellent likes of Under the Volcano (1984), Prizzi’s Honor (1985) and The Dead (1987). Phobia also comes with names on the script that should get anybody excited. There is Jimmy Sangster, one of the key figures in the Anglo-horror cycle who wrote Hammer’s cornerstone films The Curse of Frankenstein (1957) and Dracula/The Horror of Dracula (1958), among a great many others. There is Peter Bellwood, who later co-wrote Highlander (1986). There is a story from Ronald Shusett who had just had massive success as co-writer of Alien (1979) and would go onto a number of other genre scripts for Dead & Buried (1981), King Kong Lives (1986), Total Recall (1990) and Freejack (1992), and Gary Sherman who gained a minor following as director of Death Line/Raw Meat (1972) and other genre films such as Dead & Buried, Poltergeist III (1988) and Lisa (1990). Huston even has Paul Michael Glaser, a major 1970s heartthrob as the first half of tv’s Starsky and Hutch (1975-9) in his one and only leading role in a film and before Glaser’s career moved into directing with the likes of The Running Man (1987) and Kazaam (1996). Only none of it comes together. It may be some kind of cinematic dictum that there is no such thing as a good psycho-thriller about psychotherapy – duds such as Still of the Night (1982), Final Analysis (1992) and especially Color of Night (1994) come to mind, although there are one or two exceptions like Alfred Hitchcock’s Spellbound (1945) and the little-seen Whispers in the Dark (1992), not to mention that therapy plays a strong role in the excellent tv series Hannibal (2013-5). You would have thought that a director with such a list of classics to his name and the bevy of solid screenwriters on board would have made Phobia into something amazing. Only exactly the opposite happens. The plot resembles somewhat the one later used by Color of Night concerning a killer massacring their way through the patients in a therapy group. John Huston’s direction is the dull stuff of car chases and … well, that is about it. The film sedately plods from one scene to the next as though nobody could be interested to make the effort. I sat wondering why I was watching this film, what was there in it that engaged me as Huston does almost zero to involve me in terms of its story and suspense set-ups, while the characters seem almost entirely detached. The film arrives at a left field twist revelation of the killer’s identity that is groan-worthily predictable.